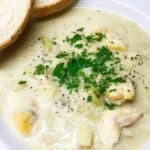 Cullen Skink is traditional Scottish thick soup, hailing from the Scottish town of Cullen in Moray on the north east coast of Scotland. Made from smoked haddock, potatoes and onions, this version is particularly thick, making it a meal in itself. Thick, hearty and full of flavour, just perfect for a dark wintery day. Put the haddock into a large pan and cover with cold water. Add the bay leaf and gently bring it to the boil. Once it is boiling, the fish should be cooked. Check the fish, give it another minute if necessary. Transfer the fish to a plate to cool down, take the pan off the heat but keep the water. 2. Meanwhile, add the olive oil to a second large pan with the onion and leeks and gently fry for 5 minutes over a low-medium heat until they are softened. Season with freshly ground black pepper. Add the potato chunks and 500ml of the haddock water, with the bay leaf, and simmer for about 10 minutes until the potato is tender. Remove the bay leaf when the potato is cooked. Remove the skin from the haddock and flake it into chunks. You now need to mash together half the haddock with half the potato, leek and onion mixture in order to thicken the soup, so either transfer half to a food processor and blitz it or mash it together in the pan. Put everything into the large pan and add the milk. Season with salt and freshly ground black pepper and bring back to a simmer. Try not to let it boil as the milk may separate. Serve with chopped chives sprinkled over the top of each portion and warm crusty bread. This dish can be prepared in advance and kept in the fridge for up to 2 days. It can also be frozen up to 3 months. I made this for the family on Monday evening. Went down a treat! Generous portions for 4 of us plus a small portion for our 11 month old grandson which I put aside before adding any salt. I will definitely be repeating this easy to follow recipe.